Bottled water across the country contains a wide variety of toxic substances, according to laboratory tests conducted by the Environmental Working Group (EWG). "Our tests strongly indicate that the purity of bottled water cannot be trusted," the study authors write. "Given the industry's refusal to make available data to support their claims of superiority, consumer confidence in the purity of bottled water is simply not justified." Researchers conducted comprehensive tests at the renowned University of Iowa Hygienic Laboratory on 10 leading bottled water brands, purchased from retailers in nine states and the District of Columbia (D.C.). A total of 38 toxic pollutants were detected altogether, with each brand containing an average of eight. Chemicals detected included fluoride, byproducts of chlorine-based disinfection, caffeine, pharmaceutical drugs, fertilizer residue, plasticizers, solvents, fuel propellants, arsenic, other minerals and heavy metals, and radioactive isotopes. Four brands also contained bacteria. 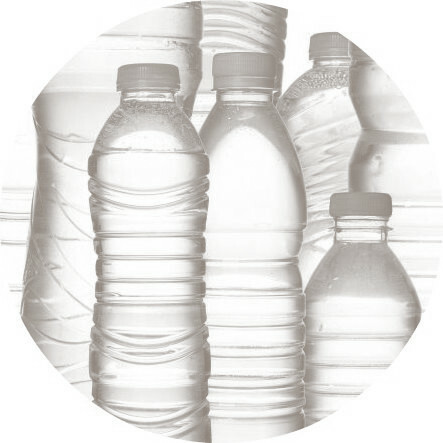 More than a third of the chemicals detected are not regulated by the bottled water industry. Voluntary industry standards regulate the following two-thirds, but water purchased in five states and in D.C. contained levels of some carcinogens in excess of even the industry's standards. "In other words, this bottled water was chemically indistinguishable from tap water," the authors write. "But with promotional campaigns saturated with images of mountain springs, and prices 1,900 times the price of tap water, consumers are clearly led to believe that they are buying a product that has been purified to a level beyond the water that comes out of the garden hose." Further analysis at the University of Missouri found that when applied to breast cancer cells, one brand of water led to a 78 percent increase in proliferation rate compared with untreated cells. The addition of estrogen-blocking chemicals noticeably reduced this effect. "Though this result is considered a modest effect relative to the potency of some other industrial chemicals ... the sheer volume of bottled water people consume elevates the health significance of the finding," the researchers write. The researchers were unable to determine if estrogen-mimics in the water came from the water itself or had leached out of the plastic bottle. In accordance with standard scientific practice, the report does not name the brands tested. Exceptions were made for the brands Sam's Choice (Wal-Mart) and Acadia (Giant), however, which contained toxin levels high enough to violate California law. Samples of both brands tested positive for trihalomethanes, which have been linked to reproductive disorders and cancer. The chemicals form when water disinfectants react with pollution. The water also contained bromodichloromethane, a carcinogen regulated under California law. In response, EWG is preparing a lawsuit against Wal-Mart to require that Sam's Choice water contain the legally required notice: "WARNING: This product contains a chemical known to the State of California to cause cancer." Acadia-brand water is not sold in California. Bottled water purchased from these brands also exceeded the bottled water industry's voluntary standards. "The bottled water industry boasts that its internal regulations are stricter than the FDA bottled water regulations," the researchers write, "but voluntary standards that companies are failing to meet are of little use." EWG notes that while municipal water companies are required to test tap water yearly and disclose the results, there is no comparable requirement for the bottled water industry. Bottled water companies do not have to test their water or reveal the results when they do; they are not even required to tell consumers where the water came from or how it has been treated. A separate EWG survey of 228 bottled water brands found that less than half revealed their water's source or treatment history in their promotional materials. Other problems with bottled water, EWG says, include its high price (an average of $3.79 per gallon, compared with $0.002 for tap water) and its environmental impacts. In the United States, the manufacture of plastic bottles requires 15 billion barrels of oil per year, the report notes, and only one-fifth of bottles used are even recycled. Many bottled waters are extracted from natural sources such as streams and aquifers, placing an increased strain on those communal resources. The report recommends that information about the source of all bottled water and any treatment techniques used on it be made available to the public, along with the results of any tests for contamination. "Currently there is a double standard: Where tap water suppliers provide information to consumers on contaminants, filtration techniques, and source water; bottled water companies do not," the report says. "This double standard must be eliminated immediately; bottled water should conform to the same right-to-know standards as tap water." Noting that bottled water consumption has doubled in the last decade, the authors recommend that consumers worried about toxins instead use home filtration systems, which cost only about $0.31 per gallon, or even $0.25 per day for a whole-house filter. Whole-house filters also remove contaminants from non-drinking water sources such as showers, preventing toxins from volatizing into the air. Finally, the authors call for immediate action to protect surface and groundwater sources nationwide. "Some Americans turn to bottled water in part because they distrust the quality of their tap water," the report says. "And sometimes this is for good reason. Some drinking water (tap and bottled) is grossly polluted at its source -- in rivers, streams, and underground aquifers fouled by decades of wastes that generations of political and business leaders have dismissed, ignored, and left for others to solve."